My name is Symphanie Thomas-Nance I am a 7th grader in chute media arts. I made this poster about equality for all and I chose this message because, it represents my poster by saying everything that people are in the world but it also shows that we are equal. ​ In my poster, I chose to not outline the faces because, I just wanted to show the skin color and not the face. For my poster, I started by finding the perfect background for me, next I typed my message for my poster, then I started to outline the people in the poster. The theme of my frame is love because, the picture that was going to be inside is the picture that says music in cool font and since I love music my theme is love so since the theme of my frame is love I put hearts as the frame to represent my love for music. This is the picture of my frame in photoshop and my hearts were originally pink but since it was going to get burned I made it black and white. This is a picture of my frame when it was finished. The thing that I noticed about the frame is that it seems to have a bit of texture to it and the hearts on the sides (left and right) are stretched out also the hearts are not properly blended in so with that being said, I'm going to fix my frame to see where I went wrong but other than that I feel as though I did good for it being my first time. This is my new frame and as you can see I changed it because, the hearts before looked pixelated and to me it didn't look right so instead of me using a picture of hearts from the internet, I used this shape tool in photoshop to make the hearts. Now one of the many things that I should do is to find a picture to fit my frame. And that's how I made my new frame. To be honest this tun out better the 2nd time than the 1st time. When I was looking at my frame I thought to myself " hey, maybe I can make a box to represent a stage for music since music is at concerts and festivals." So, that's what I did. I made a box out of wooden pieces by glueing all four of the wooden pieces together to make the shape of a square which made it look like a box to represent my stage. This is a video of me trying to use a speaker to amplify the music into the box. Then, I put my frame by the box to show you what my idea was which was to put my frame by the box to give it some dimension. Finally, I made it possible by finding a speaker small enough to fit in the box which made my box able to amplifying music from a device. Soon, I will add lights to finish off my frame then I'm done. 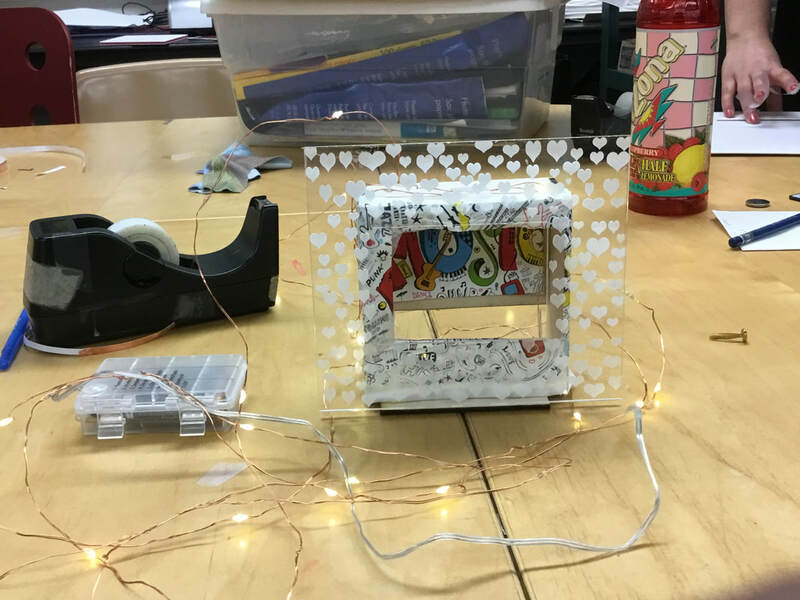 This is a video and a picture of me playing around with the LED lights so what I did was that I wrap lights around my box and I turned them on so I can see what they will look like when I'm finished with this project. So, now I'm going to find out how I'm gonna amplify the music from the speaker and see if it's going to fit inside the box. 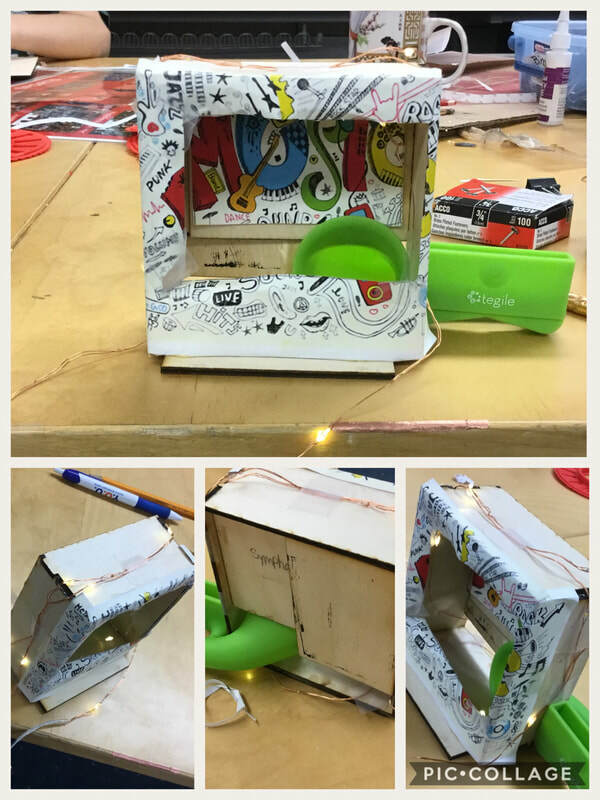 this is a pic collage of my box with a speaker in it and with the lights still wrap around it. 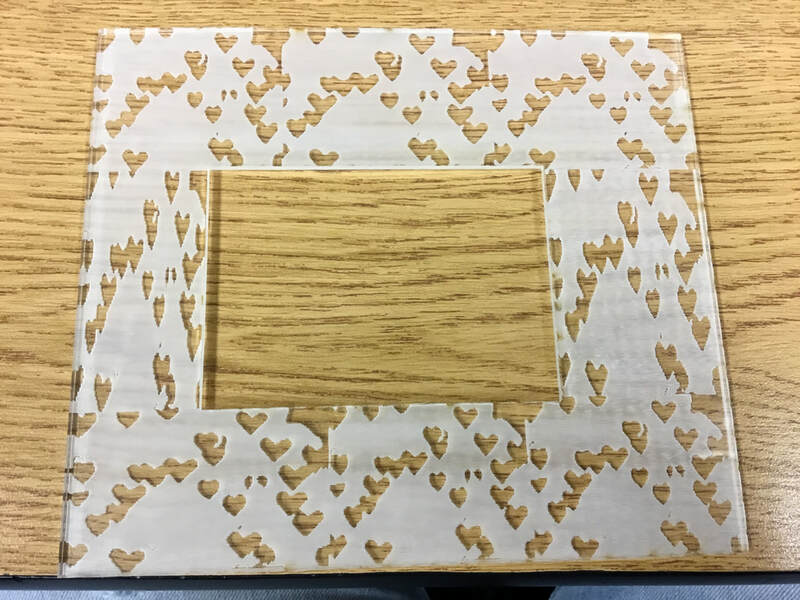 When I was looking at the speaker in my box, I realized that there was nothing to keep the sound from going out so to solve that problem I glued a piece of wood to the back of the box so the sound can stay in the front.